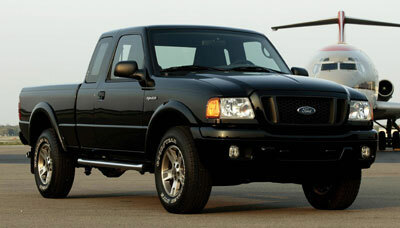 Ford Ranger has been America's best-selling compact pickup for 17 years running. While the entry-level pickups from other manufacturers have moved up in size, roominess, features and refinement, the Ranger remains the only real compact pickup. Bottom line: It's getting long in the tooth but it's still a good truck. It's now sold largely on its low price, with cash rebates to sweeten the deal. Retail prices for basic work trucks start below $15,000. Recent upgrades have improved this truck. The suspension was overhauled for 2004 with improved bushings, springs, shocks and tires all designed to improve the ride quality, and the brakes were improved for 2003. Last year saw some interior and exterior revisions as well. The result is a solid compact pickup. A Ranger equipped with the German 4.0-liter overhead-cam V6 leaps off the line and runs quickly to speed. An optional five-speed automatic available complements each available engine with close ratios for better throttle response when accelerating, towing a trailer or driving off road. For 2005, some new packages are available. The Ranger line is diverse and offers a wide range of options. Edge, Tremor, and FX4 models are available, with upgraded audio and wheel packages. There are Regular Cab and SuperCab extended-cab bodies, but no crew cab. The 2005 Ranger is available in XL, XLT, Edge, and FX4 and FX4 Level II trim levels, in Regular Cab and two- and four-door SuperCab configurations. Two-wheel drive and four-wheel drive area available. Styleside and Flareside versions are available. A 7-foot box option is available on XLT Regular Cab Styleside models. Five-speed manual and five-speed automatic ($1,000) transmissions are available. Three engines are available: The 2.3-liter four-cylinder is a modern dual overhead-cam design with four valves per cylinder rated at 143 horsepower and 154 pound-feet of torque. The optional 3.0-liter V6 is a traditional overhead-valve engine rated 154 horsepower and 180 pound-feet of torque. Ford offers this engine with flexible fuel capability, meaning it can operate on ethanol, gasoline or any combination of the two fuels in the same tank. This engine is standard on all 4×2 SuperCab models equipped with a five-speed automatic transmission. Topping the chart is a modern 4.0-liter V6 with single overhead-cams developing 207 horsepower and 238 pound-feet of torque. The price-leading Ranger XL starts at just $14,365 with the 2.3-liter engine, five-speed manual transmission, 2WD Regular Cab, 15-inch steel wheels. The XL is available with 2WD and 4WD, in Regular Cab and SuperCab. XLT adds chrome trim, interior amenities (including a CD player, tilt wheel, full carpeting), and useful truck accessories (rear step bumper, sliding rear window, mud flaps). XLT 4WD models get step bars and fog lights, 16-inch aluminum wheels. Edge models feature upgraded shock tuning and larger wheels and tires. Edge comes in 4×2 and 4×4 editions, but either way it rides at the 4×4 height. The Edge comes with either a 6-disc in-dash CD player or an MP3 player, depending on the model. The Tremor package includes an upgraded Pioneer AM/FM/MP3/6CD system with a 510-watt amp, 10-inch bass subwoofer and four large speakers. A high-output alternator keeps the current flowing and white-faced gauges add interior style. The Tremor package also includes five-spoke 16-inch wheels. The FX4 package is for serious off-roading. The FX4, based on a four-door SuperCab XLT, comes with heavy-duty shocks, skid plates, all-terrain tires, and a limited-slip rear differential. The FX4 Level II package gets Bilstein shocks tuned for improved handling on and off road. The package includes a Torsen limited-slip axle, eight-hole Alcoa forged aluminum wheels and 31×10.5-inch B.F. Goodrich All-Terrain T/A tires. It comes with stainless steel front tow hooks, black wheel lip moldings, and skid plates that cover the front suspension and differential, transfer case, and fuel tank. Two-tone, thick bolstered bucket seats and ebony interior trim lend a distinctive look, while deep-groove floor mats help protect the carpeting from slush and mud. The Ranger's exterior appearance has changed little since 2001, though minor revisions for 2004 included a raised power dome hood and subtle changes to the front end. We find the door handles a bit hard to hang onto; they snapped away from our fingers when we were in a hurry. An optional bed extender ($195) flips out and rests on the tailgate, a U-shaped cage of tubular stainless steel. It won't keep dirt in, but it will sure stop your kayak from sliding out. Full-width Styleside beds sweep a continuous line from tip to tail, while sporty Flaresides carve a recessed step into each side panel immediately behind the cab. The notch accentuates a rounded rear fender. Indentations in the bed support partitions to segment cargo. The Edge models feature a monochromatic treatment. Edge also features protective bed rails and four tie-down hooks. The running boards/stump guards look tacked on. Ford Ranger offers spacious, comfortable accommodations and convenient features. The seats were upgraded for 2004 with sculpted bolsters and higher seatbacks for improved comfort. Regular Cab models get a cloth bench seat that can squeeze three aboard. The seat splits 60/40 for access to the space behind it. Also available are optional cloth sport bucket seats and leather-trimmed bucket seats. A 7-foot bed is available on XLT Regular Cab Styleside models. SuperCabs offer a larger interior storage bay behind the front seat, with a 6-foot (71.8 inch) bed behind that. Two small side-facing jump seats may be added to the SuperCab's rear bay; each folds down from the back wall. Two optional rear-hinged doors (standard on Edge 4x4s) allow easy access to the SuperCab's rear quarters. A tachometer is supplied at all trim levels. The center pod for climate and audio systems uses large, easy-to-use rotary dials. In addition to the 510-watt system, Ranger offers a 290-watt Pioneer AM/FM/CD/MP3 system with nine speakers and an integrated power subwoofer. Edge adds a textured rubber floor cover for wash-and-wear convenience. A 60/40 split bench is standard, but bucket seats with black twill bolters are optional. The fabric in the Edge seemed tough. Ford Ranger benefits from suspension improvements starting with the 2004 models, with revised bushings, springs, shocks, and tires designed to improve ride quality. The brakes were improved for 2003. The Ranger leaps off the line and runs quickly to speed when equipped with the overhead-cam 4.0-liter V6 built by Ford in Germany. More important, it provides strong low-rpm torque for off-road work in four-wheel-drive, or for pulling heavy loads or trailers. The V6 teams with either a heavy-duty five-speed manual gearbox or a five-speed automatic with adaptive shift logic. Rather than adding a taller overdrive, the five-speed automatic adds a gear between what would be first and second in a four-speed automatic. This provides closer ratios for better throttle response when accelerating, towing a trailer or driving off-road. A high-gear lockout switch on the tip of the shift lever enables the driver to kick down a gear with the tap of a finger. Our Ranger SuperCab 4×4 with the 4.0-liter V6 and five-speed automatic delivered good performance for passing, even at altitude. It could scamper up mountain grades or effortlessly pass a line of heavy freight haulers. The Ranger handles bumps and curves with confident dexterity. Its rigid ladder-like chassis, fully boxed in the front section, combines with an independent wishbone front suspension to pamper passengers with smooth ride sensations. At the same time, the Ranger offers aggressive performance off the pavement, as we saw on a primitive track laced with lumps and rocks and tire-sucking mud pits. A high ground clearance enables the Ranger 4×4 to clear ruts and bumps easily. And when it doesn't, skid plates shield the transfer case and fuel tank from damage. A pulse-vacuum hub-lock device engages the front hubs quickly, for push-button shifting into four-wheel-drive while rolling as fast as 80 mph. A rotary dial on the dashboard provides seamless switching from rear-wheel-drive to four-wheel-drive high, or further down to four-wheel low for serious off-road maneuvers. As a work truck, the Ford Ranger offers serious truck capability at affordable prices. Watch for cash rebates and other incentives. The high-level models deliver strong performance on and off road. We like the XLT. The four-wheel-drive system with vacuum-activated hubs works very well and you can't beat the 4.0-liter V6 for performance. New Car Test Drive editor Mitch McCullough is based in Los Angeles. Head/hip/leg room, f: 39.3/52.7/42.4 in. Head/hip/leg room, r: 33.3/19.6/40.4 in.